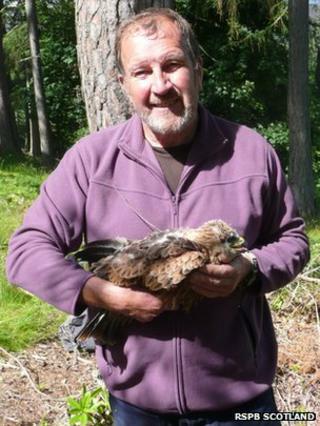 RSPB Scotland workers have spoken of their anger and disappointment after the deaths of 16 birds of prey in the Highlands. Tests have confirmed that some of the 12 red kites and four buzzards discovered in Ross-shire were poisoned. Brian Etheridge, who has worked for the charity for 27 years, said a 16-year-old female kite he tagged in 1998 was among the dead raptors. Volunteers Liz Rollinson and Eilidh Smith said the deaths were upsetting. RSPB Scotland has been working with police on an investigation into the incident. Dead raptors have been found in a two square mile area to the south east of Conon Bridge around Conon Brae, Balvail, Leanaig and Alcaig since 18 March. Mr Etheridge said: "This has been the worst two weeks of my life. "I have worked with all of the birds - each one was ringed and tagged by me. "I was there at the very beginning when they were only a few weeks old and I was there at the end when I went to collect their bodies." He added: "It's a huge mix of emotions; I've gone from being very, very angry to extremely sad. Some of these birds I've known very well and for a very long time." Ms Rollinson, 66, from Contin, one of 25 volunteers who help out at the Tollie Red Kite reserve on the Brahan Estate, near Conon Bridge, said the sky was now empty of kites. She added: "It just seems so sad, I cannot see rhyme nor reason for it. "All that hard work and time and so much effort from an awful lot of people and now this has happened. It's devastating." Ms Smith, 23, from Bonar Bridge, said: "It's quite upsetting, when you know that the RSPB and other people have put so much effort into the red kite project and it's all for nothing when they can just be wiped out like that. "It's really disappointing that we are still persecuting wildlife like this. It's something we should have moved past." Alex Matheson, from the Brahan Estate, added: "I would like to express in the strongest possible terms our total condemnation of any form of illegal poisoning. "Responsible land managers across the country are working hard to stamp this sort of thing out and show that wildlife crime is just not acceptable."